eAccess — Thermo-Tec Insulation Inc. Thermo Tec Insulation specializes in firestopping, commercial and industrial insulation. Let us meet your mechanical or plumbing insulation needs. 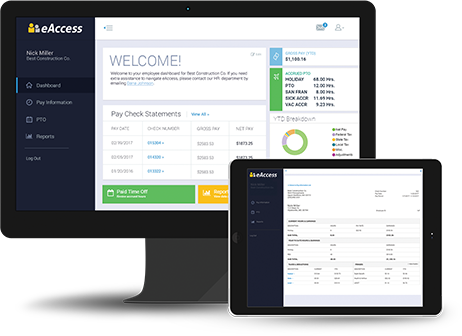 With eAccess, employees have immediate access to their payroll information whenever they want, wherever they are. Employees simply log in to their secure, unique eAccess account, and our easy-to-use dashboard packages the information they want to know. FOUNDATION’s eAccess dashboard is intuitive and easy to use. It breaks payroll data down into simple, readable sections that summarize pay-stub history, taxes and deductions, year-to-date numbers, and vacation time. Employee’s will have access to any pay stub at any time! If you need pay stubs from over a year ago with Thermo-Tec Insulation, you may login and pull this information with a few simple clicks. Secure login from anywhere, anytime . Print past and current pay stubs. Easily view and track payroll history . Use the link below to login on any mobile device or computer at any time. Forgot your password? Use the link below to have the password emailed to you. Need some training on the new eAccess Portal? Use the link below for a brief summary on how to navigate through your portal.